← All The Gear, No Idea! Before I begin, lets be totally upfront and honest about two important facts. 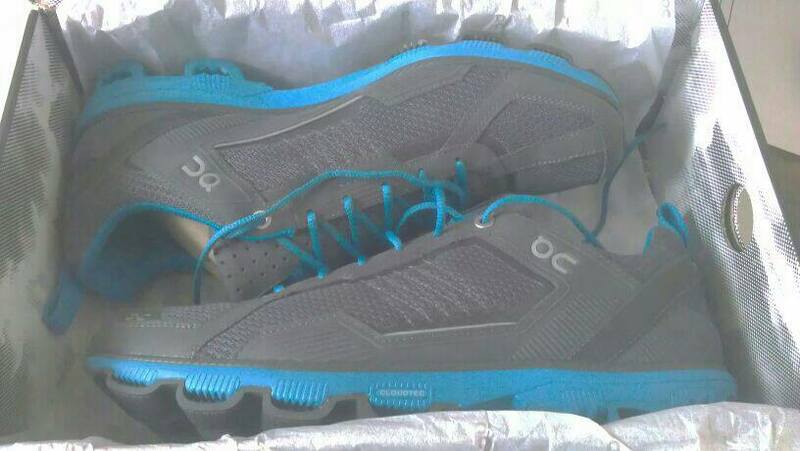 On Running UK sent me some free shoes. They did this after I spoke to them at the London Marathon Expo, Write This Run and then on Twitter. They did not ask for anything in return, and although I imagine they were hoping for some mentions in this blog, on Twitter, Facebook, at my running club etc I’m under no obligation to write about them. My opinions will always be my own and cannot be bought, at least not for the price of a pair of shoes. I mean that in an “I want to marry you, settle down and make little baby shoes with you” kind of way. Seriously, that’s how good these are. These shoes have now done about twenty miles over three runs. A gentle 5 mile plod, 4 miles of intervals including some crazy speed work and today, best of all, 11 miles of road on to hill trails with a grass meadow descent back to road. I struggle with new shoes (and often with old ones) with calf pain, ankle pain, shin pain. I suffer for my love of running, but not any more. I haven’t felt a single twinge in the Cloudrunners which is a miracle. From the moment I put them on they felt right and as they’re being broken in that comfort is just increasing. The ‘clouds’ on the sole seem to do just enough, soaking up any impact but staying firm and responsive throughout. They don’t have that wallowing, bouncy feel of new shoes which are fun when you first stand up in them but a bit offputting when you start running. From the first step the Ons felt like I’d been wearing them for 100 miles already and they were ready for several hundred more. That incredible ride carried over perfectly from road running on to the trails and the shoes felt responsive and firm enough to drive hard up dusty slopes but with enough impact absorption to really let go on the downhill, much faster than I’ve felt comfortable doing in any other shoes. Living 2 miles from my favourite bit of countryside in the UK I hadn’t yet found a shoe that could get me there in comfort, around the hill trails safely and back again on the road. I have now. Several people have commented on the aesthetics of the shoes as well. There’s no doubting they look different, but thankfully the consensus is it’s different in a good way! Different, in a good way! There are one or two things I’m going to keep an eye on though. I’ve heard they can be a bit twitchy on wet pavements and with a very shallow hexagonal tread pattern on the sole I can see why this is so. Miraculously I haven’t yet had to take them out in the wet but I’ll be watching for any reduction in performance. 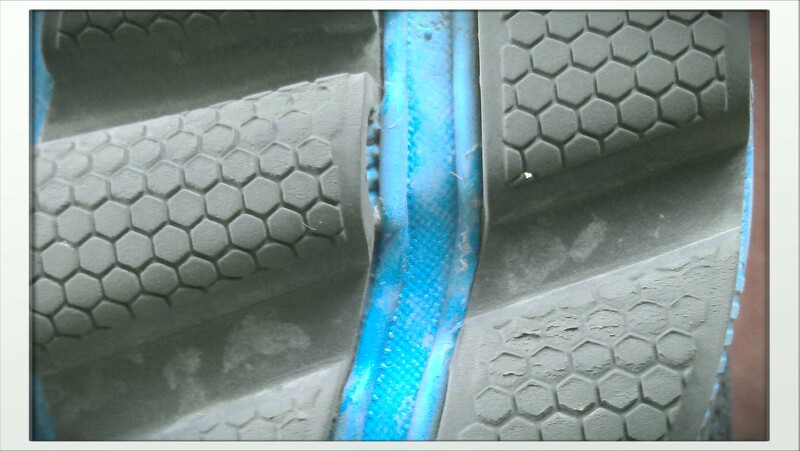 Also, having taken a look at the sole I can already see some wear on the tread, which after only 20 miles is a slight worry. Obviously there’s no impact on performance yet but again I’ll be watching that closely. I really hope those two points aren’t cause for concern though, because everything else about this shoe is incredibly positive and I wouldn’t hesitate for a second to recommend them. 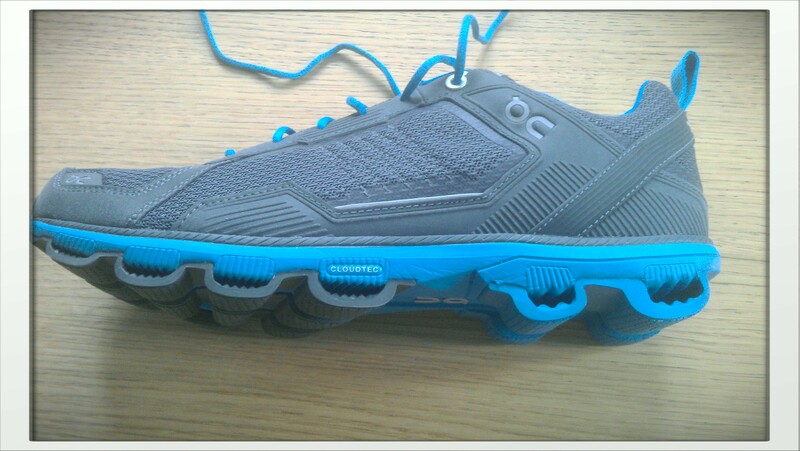 I’m already wondering who I can mug for the £115 cost of a pair of Cloudsurfers to do my speed work in, it’s going to take a lot for me to be running in anything other than On in the foreseeable future. This entry was posted in Juneathon, Kit, Running and tagged fitness, Juneathon, On Cloudrunner, running, Running Kit, trail running, trainers, training. Bookmark the permalink. Great review! I’ve worn mine Cloudrunners in the rain many times and, aside from the fact that they’re a bit squeaky, haven’t had any issues with them at all. I LOVE them! !